BEAVERTON, OREGON, June 28, 2017: Audio Precision, the recognized standard in audio test, today introduced the AECM206 Headphone Test Fixture. Headphone measurements can be complicated, owing to the close coupling of earphones to the ears and the corresponding acoustic transmission paths, as well as the need to properly reproduce the ear’s acoustic impedance. The AECM206, in conjunction with APx Series analyzers, accessories and software, provides the user with a complete system enabling precise and repeatable electro-acoustic testing of headphones and insert earphones (earbuds). 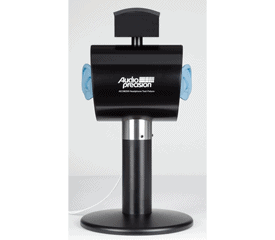 The Audio Precision AECM206 Headphone Test Fixture supports the testing of circum-aural, supra-aural and intra-concha headphones and earbuds in R&D and production test applications. The AECM206 is a dense, robust fixture mounted on a resilient base to isolate ambient noise, which can adversely affect measurement integrity. Equally capable in both R&D and production test applications, it is well-suited for testing circum-aural, supra-aural and intra-concha headphones and earbuds. The AECM206’s high level of acoustic isolation also enables the measurement of noise-reduction performance of ANC (active noise canceling) headphones, as well as the evaluation of hearing protection ear muffs. It is a more cost-effective solution for headphone test when compared with a HATS (Head And Torso Simulator), and is competitively priced with regards to comparable fixtures. Two sets of pinnae (hardness Shore OO-35 and A-25 respectively) are provided with the unit. The pinnae are symmetric, which offers convenience when testing stereo headphones and earphones. The AECM206 is also delivered with an adapter for the CAL250 sound level calibrator (optional), product documentation and disassembly tools. The AECM206 retails for US$11,024, or US$11,232 in an optional hard-shell roller case. This entry was posted in News, Press Releases and tagged active noise canceling, active noise cancelling, earbud test, earphone test, headphone test, noise canceling, noise cancelling by Eric. Bookmark the permalink.